We Dig Worms on Tour. WOW! 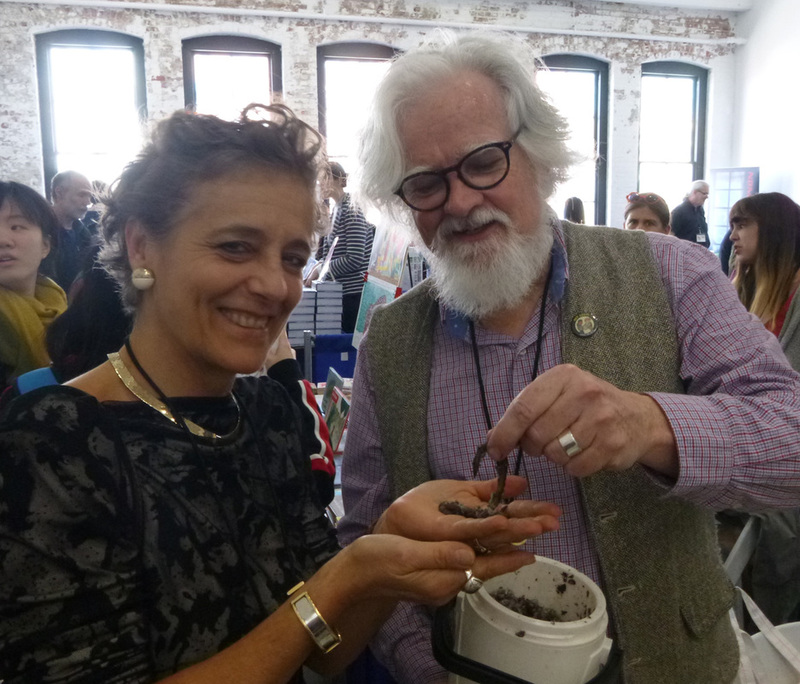 Introducing my worms to Françoise Mouly at MoccaFest in NYC. We Dig Worms! the book I wrote and illustrated at the request of my librarian wife Patt was officially released by Toon Books on April 14. Françoise Mouly, above, is editor and publisher of Toon Books. She is also the art editor of the New Yorker magazine. It was my good fortune that she personally art directed We Dig Worms! The book looks better than I imagined and has been generating a lot of excitement. Amazon #1 new release in Children’s Zoology. The big bounce came when the NY Times chose to feature We Dig Worms in the Sunday Book Review, “One of Toon’s stylish comics-inflected early readers, this paean to the worm is a winning combination of facts and gross-out fun.” The book became Amazon’s number one bestselling new release in a number of small categories, including Children’s Zoology. 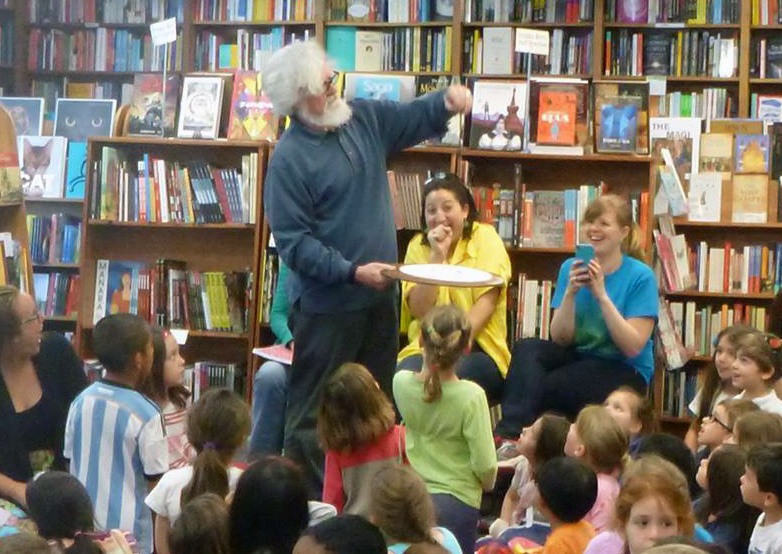 150 children for Earth Day at Politics and Prose Bookstore, Wash, D.C.
150 children showed up at Politics and Prose Bookstore for Earth Day in Washington, D.C. The crowd went wild when a large nightcrawler got out of the bucket and hit the carpet. After that bookstore event, An Open Book Foundation brought me to visit an inner city school, Simon Elementary. 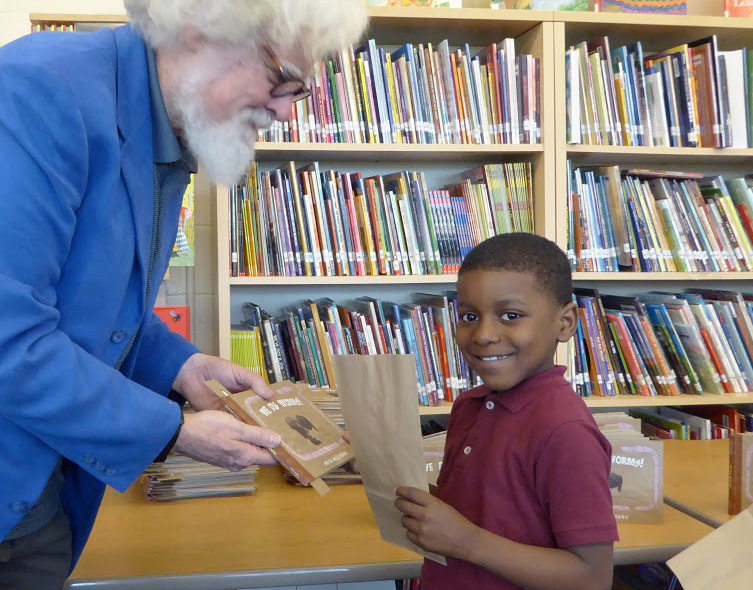 Thanks to the generosity of Simon’s “Book Buddies” outreach program of the Washington Hebrew Congregation, each of the nearly 90 children I met there got a copy of my book. We sang “Happy Earth Day” to the worms. It was sweet. 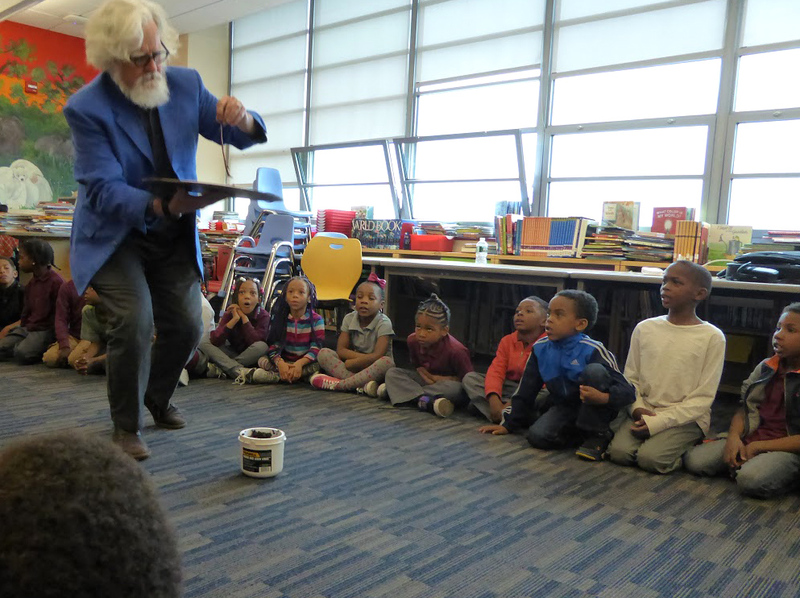 Each kindergarten student at Simon Elementary got a copy of We Dig Worms! The tour continues. This week I will be at Firefly Books just up the street from my home in Kutztown. I will be heading to San Francisco’s Academy of Sciences and to the Brooklyn Book Festival. The full Worm Tour schedule can be found at Toon Books or on my Amazon author’s page. A page from We Dig Worms! My wife Patt, has been a trooper on tour. She is fine with the new worm bins in our basement laundry room. She even made a short video of a worm race, you can see it at Vimeo. 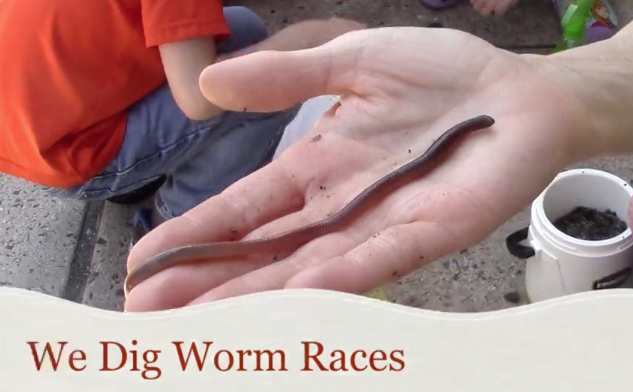 Watch a Worm Race, link above. TOON BOOKS may not be not the biggest children’s book publisher. They do make beautiful books, and in my experience give their authors great support. They even made temporary We Dig Worms tattoos for me to share at book events. They are having a “We Dig Worms” Earth Day art contest. Deadline is Monday, April, 27. Like Toon Books on Facebook and learn more about all the cool things they do. < Previous Kutztown says hello! to NYC. earthworms have been growing in our compost (suburban) for more than three decades. They wave back.